JIN ZHI JIE YIN HAN SHU YE = Golden Jasmine Purify Gums Oral Gargle Liquid Use orally to dry and transform dampness, clear heat, damp-heat, and toxic-heat, purge fire, cool blood, reduce inflamation, detoxify lesions. Also use for various conditions such as general inflammations and infections, bacterial infections, gingivitis, mouth sores and ulcers, thrush, bad breath, before/after dental visits and procedures, and daily oral hygiene. 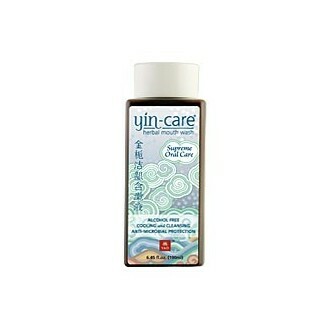 Comments Yin-care Supreme Oral Care is a natural extension of the widely used Yin-care formula for general bacterial, fungal and viral complaints. This anti-microbial mouth rinse is comprised of both the water-extracted and essential oil materials of the herbs listed below and can be quite effective when used for acute conditions or for daily hygiene. 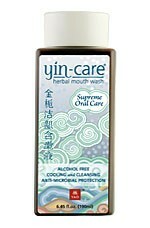 Specifically formulated for oral use Yin-care Supreme Oral Care is alcohol free, naturally sweetened with stevia and mint essence for improved flavor, and glycerine added for better gum adhesion. Pseudolarix - Tu Jing Pi and Atractylodis - Cang Zhu are not included in the formula. Caution Do not swallow, not be taken internally. Not intended to replace brushing and flossing. In rare instances, sensitive patients may react to this product. Keep out of reach of children.